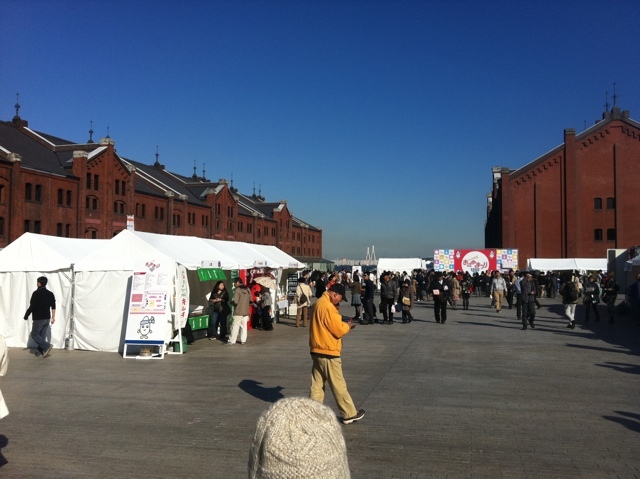 The Okome Matsuri, or Rice Festival, is being held at Yokohama’s Aka Renga Soko this weekend. 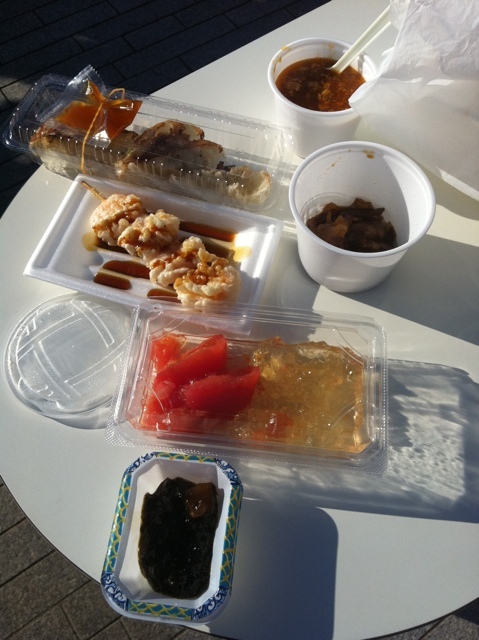 My family and I went to it yesterday afternoon and enjoyed the sunny weather and plenty of food. Aka Renga Soko is often used as the site of many events. 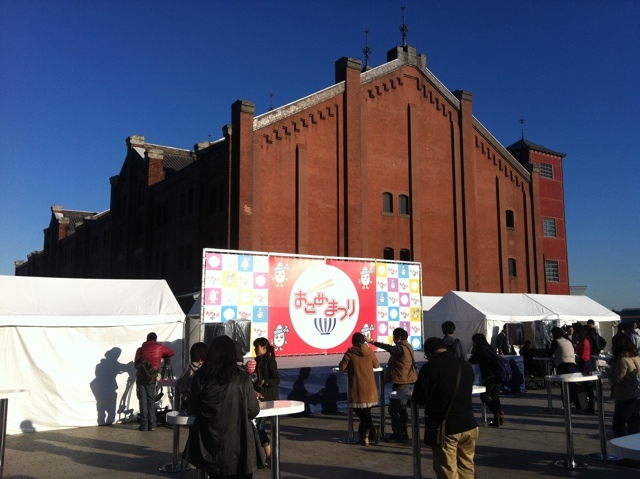 Oktoberfest is also there. 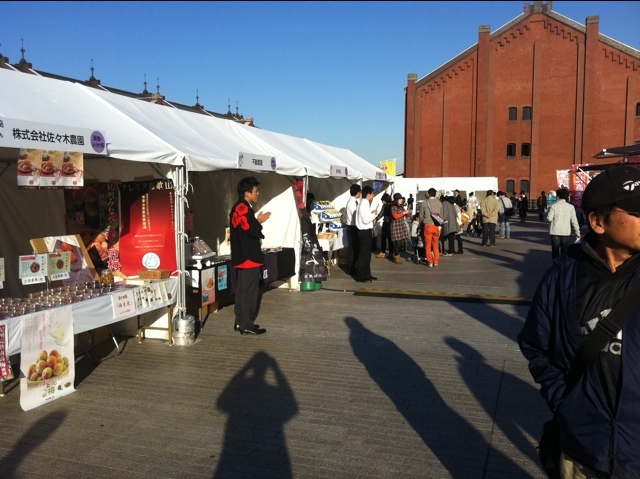 At the festival, there were several tents set up for food vendors, which were selling a large variety of interesting foods. I’d like to talk about what I ate, since everyone was there for the food. 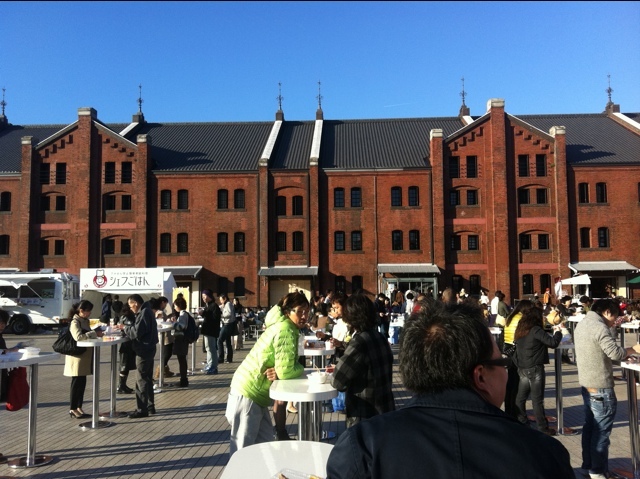 The festival grounds with the Red Brick Warehouses in the background. 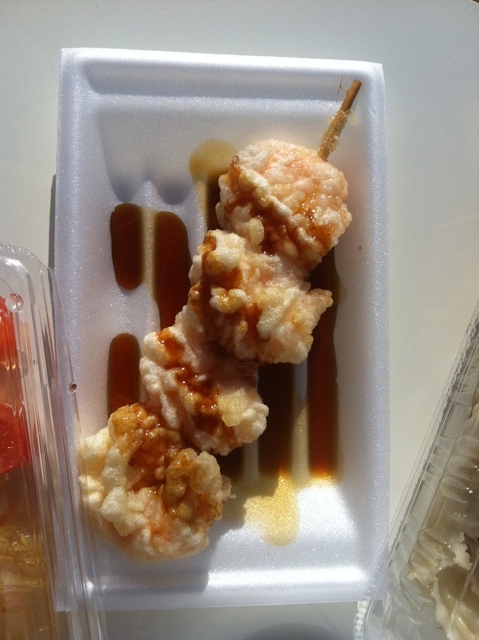 Ebi kushiten (Shrimp tempura on a stick) was pretty good. I love shrimp tempura, and the sauce was very good. 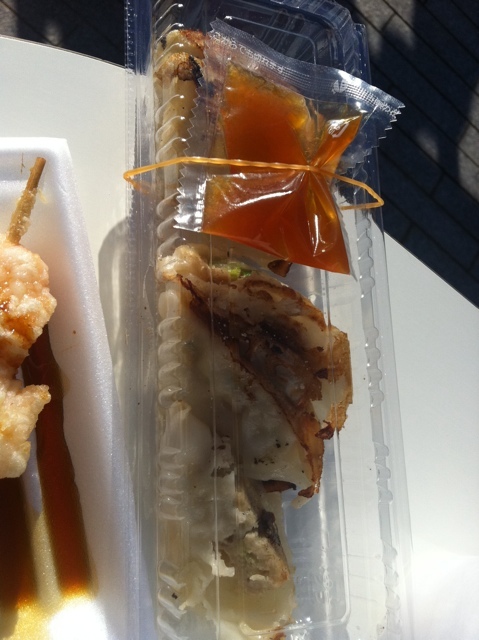 Maguro gyoza (tuna gyoza) was an interesting food. Usually, gyoza has pork and vegetables in it, this had tuna. It was quite good. This was some of the food, including mabodofu (at top), maguro gyoza, pork, ebi kushiten, and some tomato dish which I didn’t eat. At the bottom was nori. Grilled chicken with onion sauce was delicious. 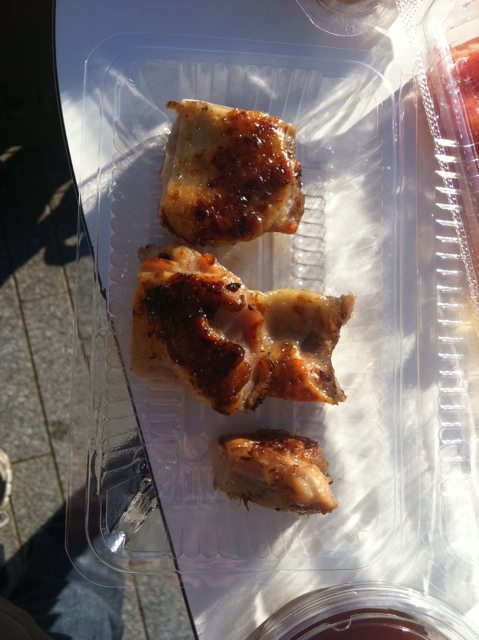 I love grilled chicken! 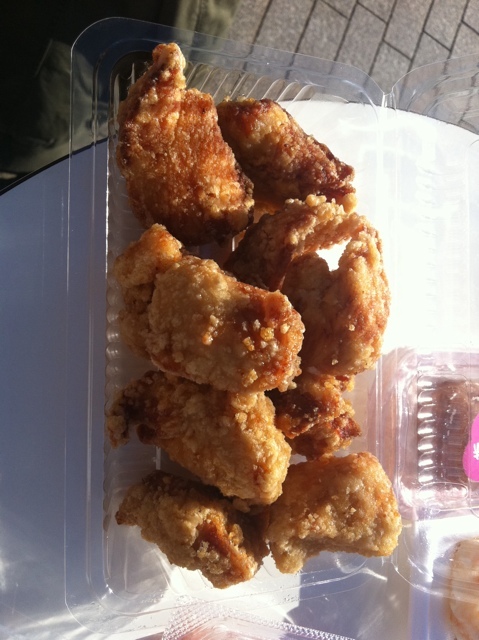 Tenkara, which is karaage (fried chicken), was very good. It seemed to have a bit of a garlic flavour. In addition to the above food, we also had 6 kinds of rice. There were 12 types of rice available, but we chose 6. Honestly, I didn’t find much of a difference between them. Other people enjoying the festival. There was a lot of good food, and I enjoyed trying it. I filled up on rice and plenty of meats. 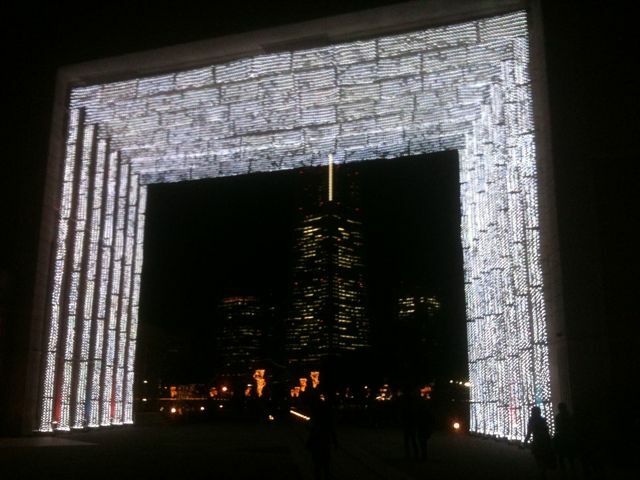 It’s running until tomorrow (November 18), so if you want to check it out, I definitely recommend it. 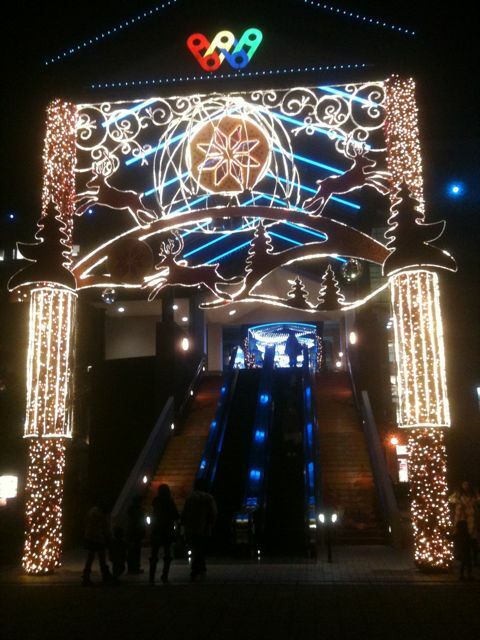 These escalators do actually go somewhere, but this is something you’ll see everywhere right now. 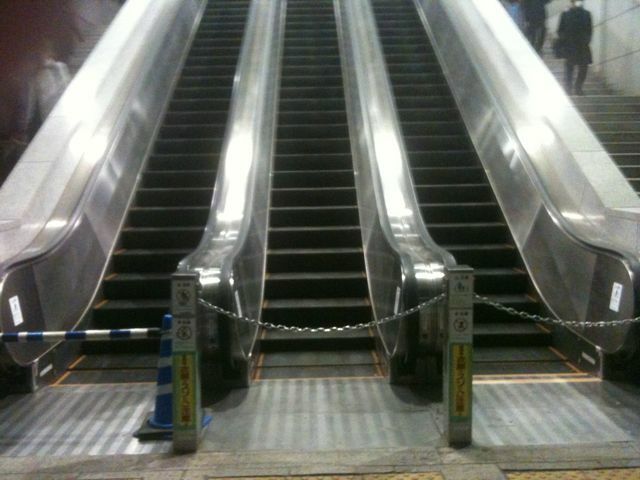 Due to the power shortage, most escalators are turned off to help conserve energy and prevent blackouts. It may be a bit inconvenient for some, but it gives people more exercise. I’ll let these pictures speak for me. 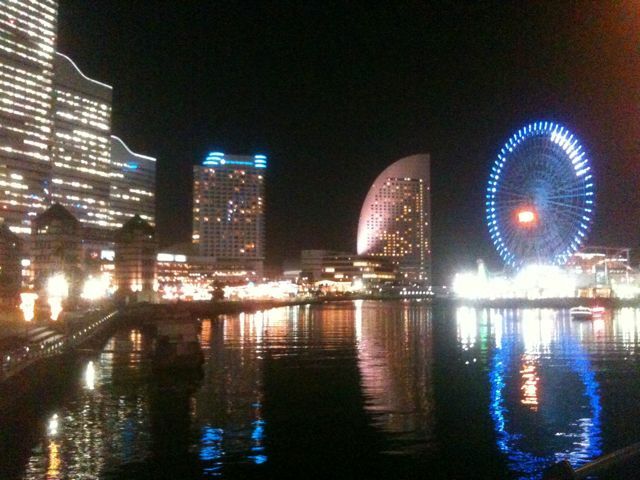 Earlier this week, I was at Minato Mirai at night. 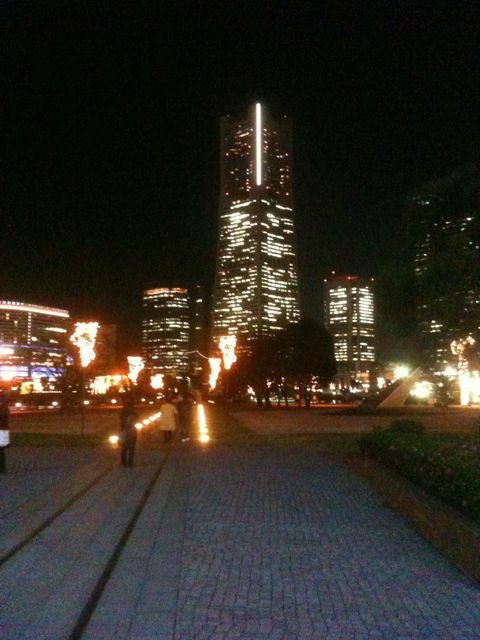 There are lots of lights there. It looks great! These photos don’t do it justice. But I hope you enjoy! I’ve managed to join this weekend’s “Show Me Japan” while on holiday in Canada! 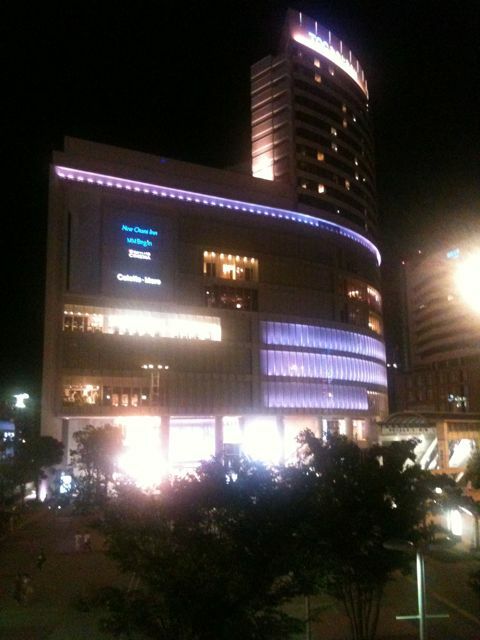 Earlier this week, I ate at American House restaurant in the new TOC Minato Mirai building by Sakuragicho station. 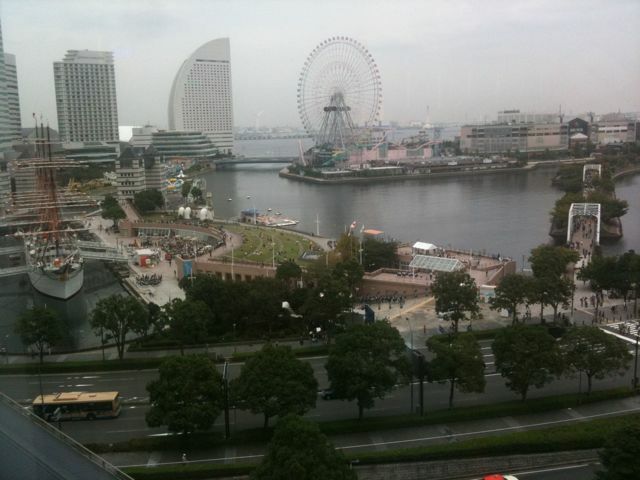 This is the view from the restaurant. 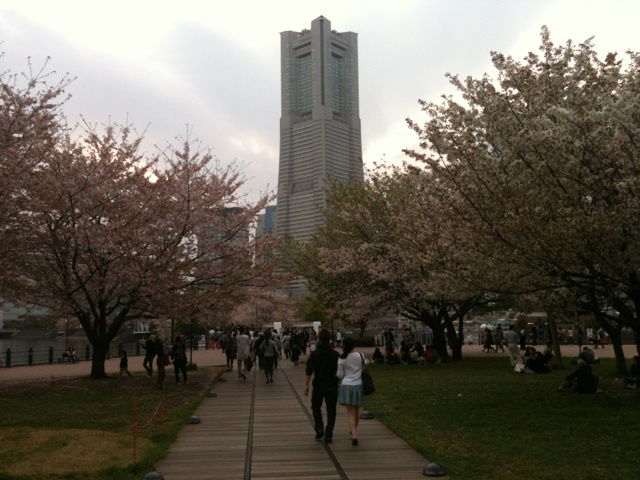 From Sakuragicho Station to Landmark Tower, there’s a long moving walkway to make your walk easier. 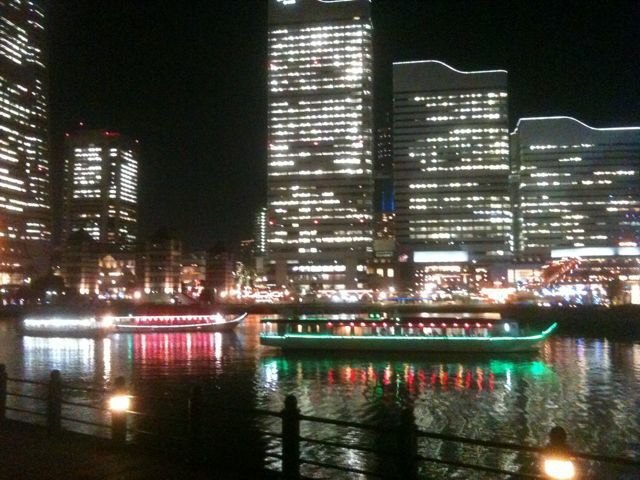 This picture was taken from the end nearest the station. 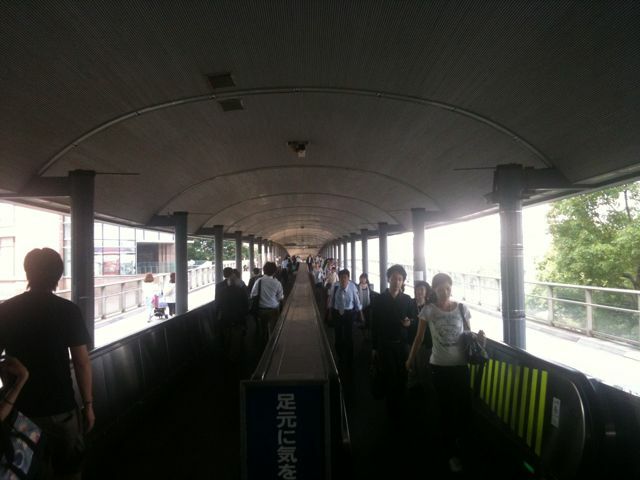 That's a long moving walkway at Sakuragicho. 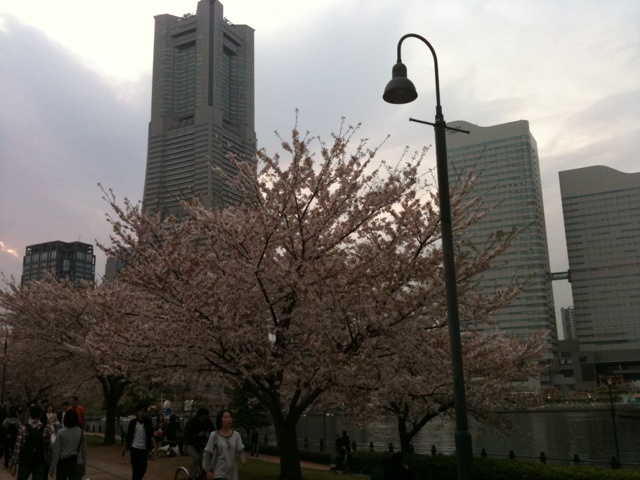 Yesterday, I had a great chance to take these pictures. They were taken from near World Porters. Unfortunately, some dark clouds were moving in from the west. 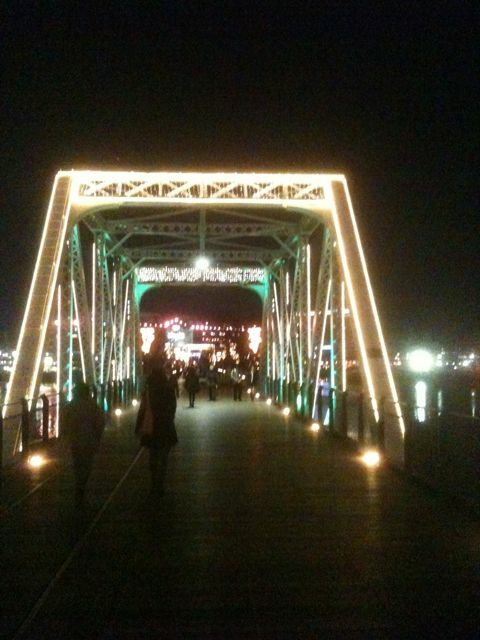 Here's the view from Kisha-michi Promenade.